This frustrated me, because the story was so clearly not of this nature, and yet people were still imposing this reading onto it. However, I had quite a different reaction to these same sort of statements coming from parents of children with disabilities. If they saw this story as proof that their child could attend college, and live on their own, and have friends, then I was glad. I wanted these parents to know that what is holding people with disabilities back from being able to do things like go to college or live on their own isn’t their disability, but the pure failure of the world and society to accommodate them. Certainly being disabled comes with its difficulties. I don’t think anyone with a disability would deny this, whether they believe their barriers come more from their condition or more from society being poorly adapted to us. However, focusing solely on this aspect of disability strips us of the incredibly nuanced and complex experiences that being disabled and human comes with, and it forces us into caricatures of pity and triumph. This narrow narrative was evident in the influx of ableist new coverage following Stephen Hawking’s death, from USA TODAY’s original obituary (which they eventually changed), which claimed Hawking did great things “despite his physical ailments,” to CNN’s obituary, which said Hawking “overcame a debilitating disease.” And then there has been the response from both the media and the world, which continually put “Hawking” and “inspiration” in the same sentence. When I saw this response from able-bodied people, I cringed. However, I soon started seeing comments from disabled people also calling him inspiration. This made me take a step back and think. There are people in the disability community that inspire me – role models that I look up to, individuals whose writing, speaking or art makes me think and grow. When I see these fellow disabled people, like Jillian Mercado, the late Stella Young, or Ruby Allegra, I see myself represented in a realistic, human manner. I see what I am capable of accomplishing. I see what is possible if the disability community keeps fighting for rights and access and representation. To me, this seems similar to the sentiment that has fueled parents of kids with disabilities to call me an inspiration – a realization of what is possible. This is altogether quite different than what lurks behind the average able-bodied person praising those with disabilities as being heroic – a need to keep us in the category of brave, simplistic, and child-like figures so that they don’t need to grapple with their complacency in society’s continual shoving us off to the side. 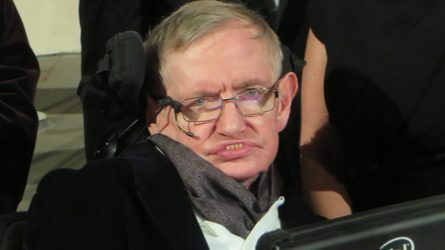 Being inspired by someone with a disability, such as Stephen Hawking, is not in and of itself a bad thing. Like being disabled, it’s much more nuanced than a simple black or white, good or bad scenario. But realizing the complexity of this requires self-examination, honesty and most likely discomfort, if you’re faced with a reason for being inspired that doesn’t jive with viewing the disabled person in question as a full, complicated person. Hannah Soyer is a creative nonfiction writer and journalist. She is the creator of the This Body is Worthy project, and founder of Freedom Words, a program to design and implement creative writing workshops specifically for students with disabilities. She currently lives in Iowa City, Iowa.